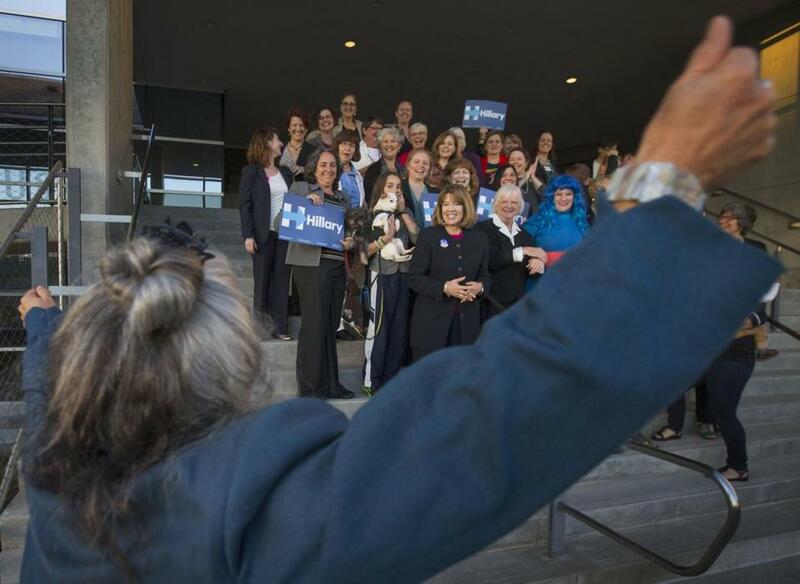 A gathering of Pantsuit Nation members in support of Hillary Cllinton took place on Election Day at the Wayne Lyman Morse United States Courthouse in Eugene, Ore.
Libby Chamberlin, the Brooklin, Maine-based founder of the popular, invite-only Facebook group Pantsuit Nation, acquired a publishing deal for a book this week, invoking the ire of many on social media. According to a post on the private page, the book will be a collection of some of the stories and images shared by the group’s nearly 4 million members. Following the book deal announcement on Monday (currently the pinned post on the page), Pantsuit Nation page members began expressing their disappointment and anger at what they perceived to be Chamberlin’s profiting from their social media presence. “Disgusting opportunism. I am horrified,” one user wrote, which others mirrored in comments describing a “betrayal of trust” and monetization of a safe space. “This is gross. Gross. Gross. Gross,” one commenter wrote. The 33-year-old Chamberlin’s post announcing the deal says that she “believe[s] that collecting our stories in a book is an important step, and a very exciting one.” She wrote “the book will further our mission and the premise that stories give meaning to action and that meaningful action leads to long-term, sustainable change.” Comments have since been disabled on the post. Chamberlin started Pantsuit Nation in late October as a Hillary Clinton support page and has continued as a rallying spot after Clinton’s election loss.